Trainee/Internship programs are designed to allow foreign college and university students or recent graduates to come to the United States to gain exposure to U.S. culture and to receive hands-on experience in U.S. business practices in their chosen occupational field. We sponsor Work & Travel, Intern, and Trainee J-1 programs. Connecting businesses to enthusiastic, highly educated and skilled international students. Aspire Worldwide, a Program conducted by ASSE International Student Exchange Programs, provides exceptional university students and graduates from over 50 countries with short term seasonal work opportunities as well as internship and training positions with host companies throughout the USA. Participants are either fluent in English or are native English speakers, bright, congenial and highly motivated, providing host companies with flexible and competent human resource solutions to their staffing needs. Work and Travel participants are full-time university students from Europe, Asia-Pacific, the Middle East and the Americas willing to fill seasonal job positions for up to 4 months, in return for having the opportunity to live and work in America and, at the conclusion of their job, travel and see some of the USA before returning to their studies in their home country. Internship and trainee participants are anxious to learn about American professions and the field of management through practical firsthand, full-time work and training for from 4 months to a year and a half (18 months). 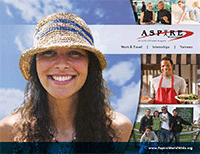 In short, the ASSE Aspire Programs provide full-time university students, graduates and those experienced or specialized in a particular field the opportunity to learn about American private and public sector companies and organizations through working and training firsthand with those organizations. ASSE has developed the Practical Training Program in order to give opportunities to qualified students, recent graduates and young professionals. This opportunity consists of participating in a Practical Training Program for up to 18 months within an American company. Through this program, participants will gain valuable international practical experience and will boost their career. In order to seize the future, students and young professional should consider gaining this unique experience by participating in a practical training program abroad. View full list of our Summer Work Travel or Intern/Trainee Program Overseas Partners. The whole year of experience was awesome, I learned a lot from my internship here. Thank you ASSE Aspire for this great opportunity, I hope you will help more students to learn the real world of hospitality industry. I’m particularly happy of being in New York City. The cultural offer is amazing, there’s always something to do. As an architect, living here for a certain amount of time is a way of gaining a crucial experience for my professional career. Just a great learning experience and one of the best chances you are likely to get to work with many of the world’s premier chefs. I had a great experience, I met amazing people here, I saw a lot of different cultures and different places. Looking for more information? Download our PDF brochure!